A unique opportunity to enjoy the fabulous Antigua Caribbean sea sailing along the north-west of the island on a comfortable sea taxi boat stopping at 2 different beaches: we can choose one and relax on the beach half day or full day or visit both. Flexibility: you can stay full day or half day and visit one beach only or both. The taxi boat makes a stop at each beach every 90 minutes! We disembark and are welcomed by our guide who takes us to our sea taxi boat and anchored not far from the ship. 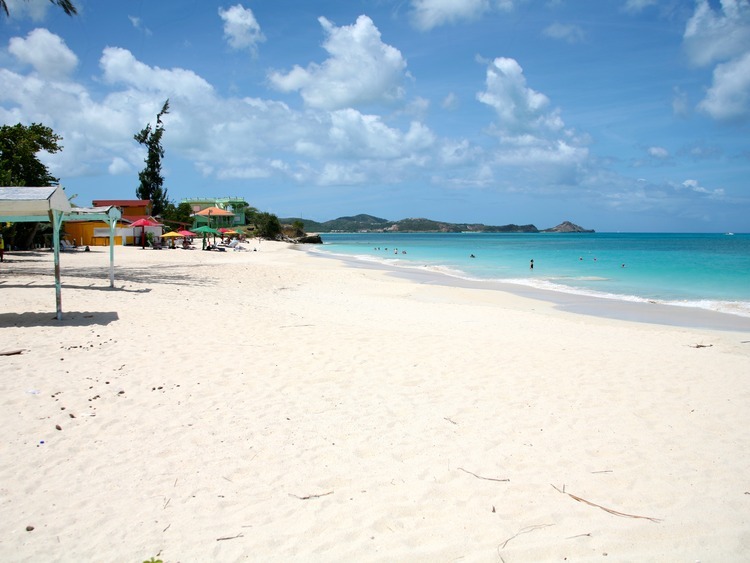 We go on a pleasant cruise along the north-western coast of Antigua to discover three of the island's most renowned beaches. We are free to decide when and where to disembark: the boat will stop at all three beaches every 90 minutes. The first destination is Fort James.. The catamaran will slowly sail past giving you ample opportunity to take photos of this famed landmark at the entrance to the Harbor. Built in 1739, it still has its full compliment of cannon in place. The Fort offers an opportunity to step back in time and fabulous views of St John’s Harbour and photographic opportunities of the harbour, your ship and the lovely Antiguan coastline. Last stop is Runaway Beach. The Mystic Beach Bar & Restaurant hires out loungers and parasols and sells food and beverages to make our stay on the beach more pleasant.